I was dying to try out the gorgeous Milani Jewel Fx in Gold I won from Michy and to use some of the new nail art things I received so I decided to change my polish and incorporate them into my next mani. I didn't want a full mani using Gold because I knew it would be hell to remove so I went for something pink but still blingy! I used 3 coats of Essie Pop Art Pink as a base on all fingers except accent finger. I only have the mini of Pop Art Pink which I hauled ages ago from the Art of Spring collection. It's a lovely pastel pink jelly that takes a few coats to reach opacity but it doesn't feel thick at all on the nail. I forgot to take a swatch picture of it doh! I then added some pink, purple, gold and silver rhinestones, gold beads and half pearls to my thumbs. Unfortunately the gold beads bleed =( I drew 2 curved stripes on my index fingers using Art Deco striper polish in gold and added pink, purple and silver rhinestones again. Topped it all off with a coat of Color Club Vivid Color Intensifying topcoat! I love the Milani Jewel Fx glitters and I want the others now! Do you have any? What's the easiest way of applying them? I love how you used it as an accent nail. Very cool. Gorgeous manicure, I'm in love with the random clutches of beads, rhinestones and pearls <3 Super pretty! So cute : D I love how you mixed and matched it all in no particular pattern.. Looks great! 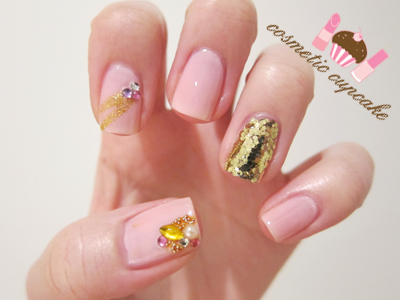 I lovelovelove the way you placed the beads and pearls on your thumbnail! And using the Milani as an accent nail was a great idea as I find it quite overwhelming when used as a full manicure. awwww thats so cute and your nails' shapes look very nice too! @Rachel Marie: If it were easier to remove I would have used it for a full mani! @Jette Fromm: I'm so glad you like it! I didn't really have anything in mind so just placed them randomly hehe. @Lois: I'm so happy you like it Lois! I think the Milani Jewel Fx just made the mani pop hehe. @Kenzie: That's such a shame Kenzie. I too would not be able to obtain it either here in Aus if not for the wonderful generosity of wonderful International ladies like Michy! @♥ c.angie ♥: Awww thanks Angie! @Krissy: LOL that's why I had to force myself to only use it for my accent nail! Even though it was only on 1 finger it still took a good 10mins to get off haha. It was worth the trouble though! I bought an Essie nailpolish, my first. It is in chinchilly and I really like it? Have you tried it before?